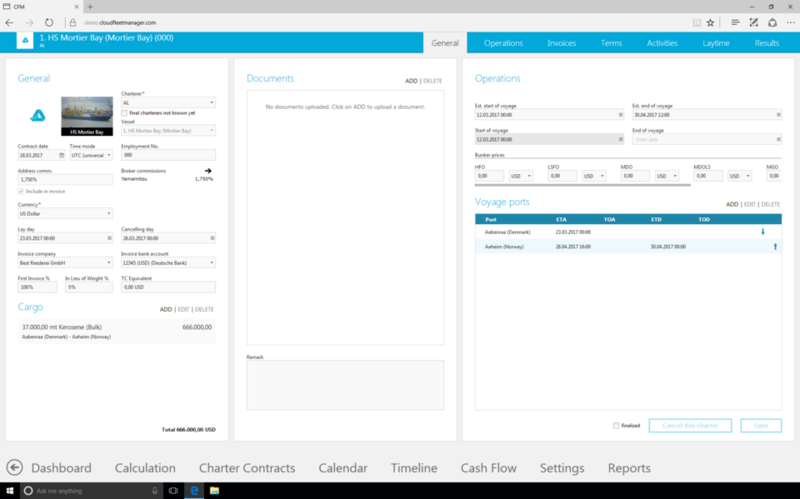 The Charter module gives you everything you need to quickly and easily plan and maintain your vessels’ time and voyage charters. 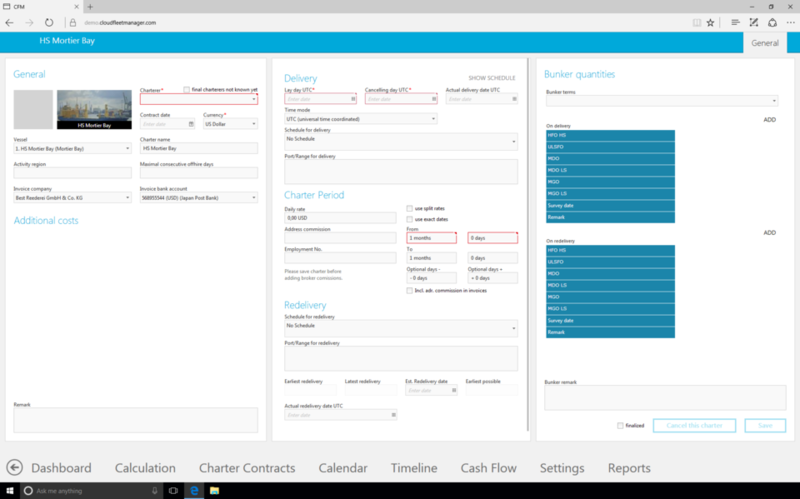 Draw up contracts in a few steps and automatically create invoices. 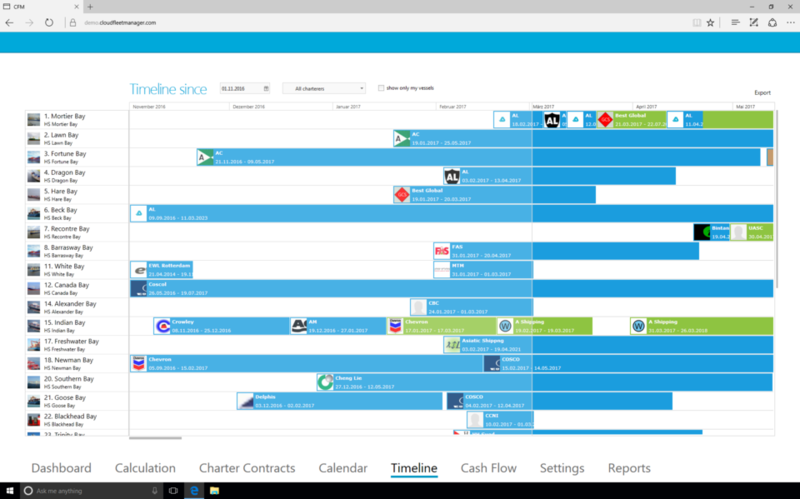 Easily conduct laytime calculations, forecast earnings from charter agreements and execute post calculations. All data is integrated into the Offhires module. 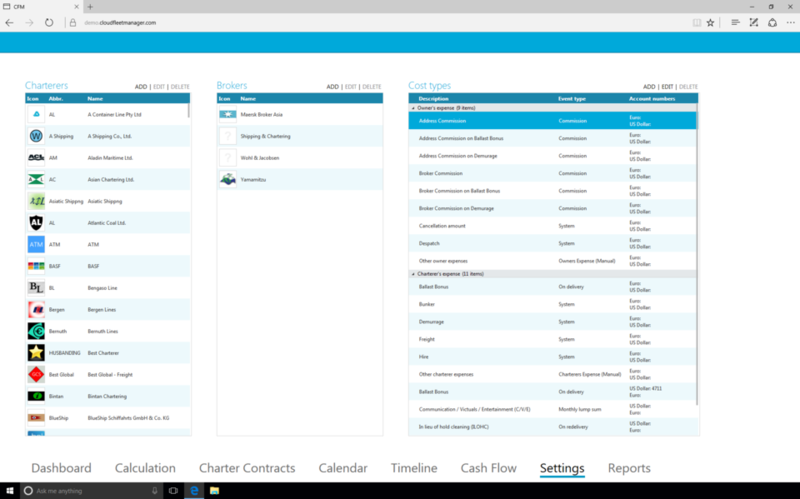 To stay on top of things, the most relevant information is always highlighted – from vessels without charter over missing invoices or overdue payments to upcoming charters. 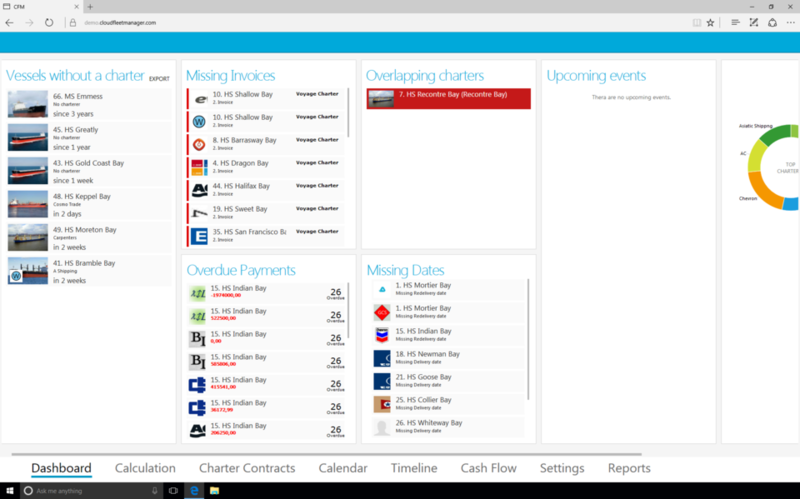 On the dashboard, the most relevant information is shown – from vessels without charterer over missing invoices or overdue payments to upcoming charters. Further areas support you to bear all important aspects of chartering in mind. Draw up contracts in a few steps and let the system create invoices for you automatically. Moreover, you can record charter conditions. Define, who is liable for vessel damages or who is responsible for the seaworthy condition of the vessel. CFM Charter module offers many advantages for the contract design of time-chartered vessels. CFM Charter and CFM Schedule have a direct connection. For that reason, you are always informed about your vessels’ schedules. 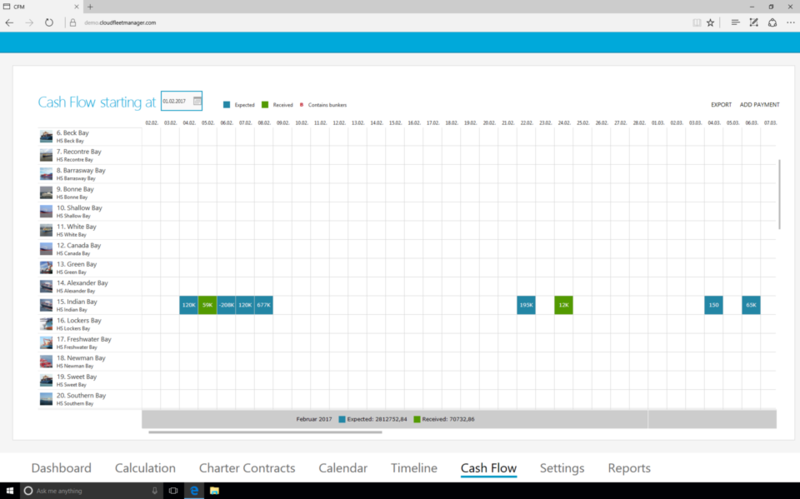 Furthermore, you can charge invoices at intervals or at a specific point of time. Moreover, you can define the commissions and charge the bunker. CFM Charter keeps useful features available for your voyage charters. The direct connection to CFM Schedule module informs you about your vessels’ schedules. 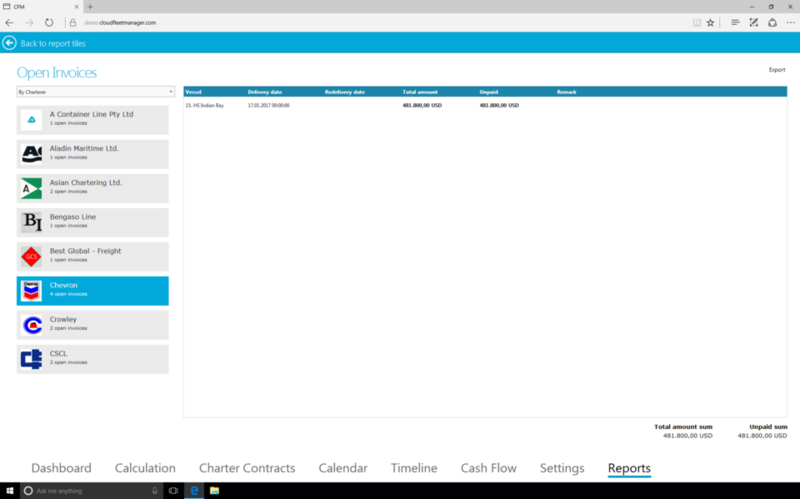 Furthermore, you can easily create invoices. For your voyage charters, you can execute pre-calculations. After the charter-period, you can do a post calculation to check your evaluation. Graphics visualise i. a. the bunker consumption and the remaining voyage route. The cash flow area provides an overview of earnings from charter agreements, divided into expected and received earnings. Moreover, it helps to conduct pre-calculations. For a fast overview, the timeline visualises the charter periods. In the settings, you can fast and easily maintain the charterer and broker, with which you collaborate as well as the cost types. A variety of reports evaluate data for you and make them available listed in tabular form. The “Open Positions Report” gives you an overview of all invoiced positions. Simple contract design, no more tedious collecting of components of contracts. For a perfect overview of your revenues, the pre-calculation aids you. Reports evaluate data and make them available listed in tabular form. Curious to learn more about Charter? We’re with you every step of the way with dedicated customer success and professional training teams.